"The one thought that crossed my mind was Steve Jones." -Ryan Hall on going through the half-marathon in 1:02:13 at the London Marathon. Hall ran like Jones because soon after he went to the front and told the pacemakers to pick it up. "When I first got up, the first thing I did was feel my teeth as I felt my teeth had fallen out." -Geti Wami after falling hard at a water stop at the London Marathon. Wami got up, was dazed a bit as she drifted farther behind, but then battled back to the lead pack before having to settle for 3rd. 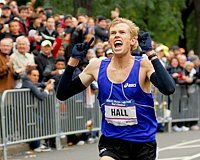 LetsRun.com Ryan Hall Reflects On his Incredible Run We tell you (and let you watch) what Ryan, his dad, his grandad, his coach and even Martin Lel had to say about Ryan. Lel was full of praise for the American and shocked by Ryan's attempt to get the pacemakers to go even faster. If Hall didn't already have your respect, he does after reading this article as he pays homage to a throwback type of guy Steve Jones. Text and Video. Maurice Greene Defends Himself He says he never used drugs but did pay for teammates bills without asking what it was for. Greene: "This is a bad situation for me. My name's come up in something and it's not true. *Is it just me or is it obvious what Wejo's ad on the front page means? From Walter Dix, to Meb Keflezighi, to Carolina Kluft, ultramarathons, childrens' toys, Nike, Rashid Ramzi, and Ryan Shay we got got it all covered. Plus Rojo's finest moment. Good Development 8,000 Women Run Road Race In Ethiopia - Gezhagne Abera's Cousin Wins It. Interesting side note, the race was the first one in the country that used Champion chip timing. XMan Runs 44.9 Relay Split The xman had a disappointing year last year in his first full year as a pro - both on and off the track. Looks like the Olympic motivation is causing him to get motivated. 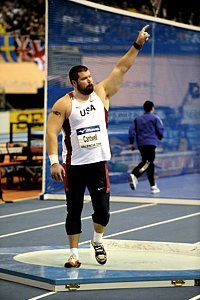 IAAF Extends Mondo Partnership Through 2019 We see no need for an 11 year contract.